We posted here that Jacobs Engineering admitted rail costs too much and does too little when they presented their Bus Rapid Transit (BRT) proposal to the TMT a couple of weeks ago. Graft, waste, fraud and abuse abounds on costly rail projects. That is why they are rail boondoggles that leech off of taxpayers. We all know about the CA HSR boondoggle. It is in such a fiscal mess, it most probably will never be completed. But some grandaddies of costly rail projects are in NYC (emphasis mine). There is a circle of cronyism and graft between transit officials, consultants, special interests who benefit and politicos. The vendors that worked on the East Side Access, Second Avenue subway and No. 7 line projects have given a combined $5 million to New York politicians since the projects began in 2000, a Times analysis found. Parsons Brinckerhoff, who was responsible for Boston's infamous Big Dig boondoggle, keeps changing their name. 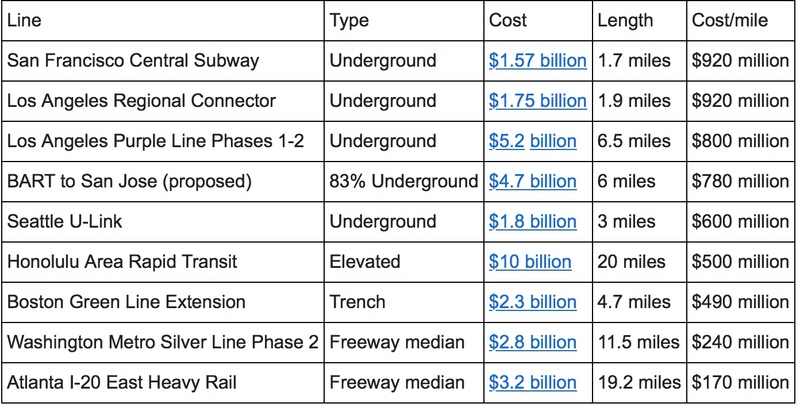 Cost per mile is only one metric to consider regarding transit/rail projects. Ridership is key and must also be considered. The cost per passenger trip must be considered for cost-effectiveness and will reflect whether the asset built will be highly utilized or not. The cost per trip will be lower for more highly utilized assets that are used by more people and for the broadest use. That is why the cost per trip for roads is so much lower when compared to transit, especially costly transit. Roads are highly used and broadly utilized for numerous purposes. 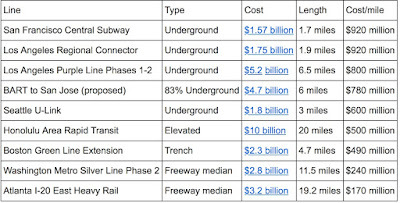 The CityLab article suggests that the capital cost per rider also be considered with transit projects. They estimate the capital costs per rider for rail projects in Europe is between $10K and $25K per rider. They even estimate the extremely costly, fraught with waste and abuse, NYC Second Avenue subway at a capital cost per rider of $25K, due to NYC density and estimated 200K trips per day. Let's take this analysis closer to home. With this latest $1.5 million taxpayer funded transit campaign, Jacobs Engineering had to "create" a transit project with a cost per trip of $8-10. That cost per trip is required by the FTA to meet the MEDIUM rating to enter the federal transit funding pipeline. So of course, costly rail fell out. Jacobs started with the capital costs of the expensive taj mahal version of the fixed guideway BRT (from Wesley Chapel to downtown St. Pete) at a cost of between $2.3 BILLION and $2.9 BILLION. That resulted in a cost per trip of $45, way over the $8-10 range to meet FTA criteria. The taj mahal BRT cost too much and did too little too! A year later, after spending tons of taxpayer money and ridiculously throwing light rail out as a viable option, Jacobs then "value engineered" the taj mahal BRT project by working backwards. They worked backwards to pigeon hole what could possibly be built with a cost per trip of $8-10. Thru reverse engineering, Jacobs was able to reduce the capital costs of the proposed BRT from billions to about a HALF BILLION ($500 million) to supposedly get to that $10 cost per trip range. 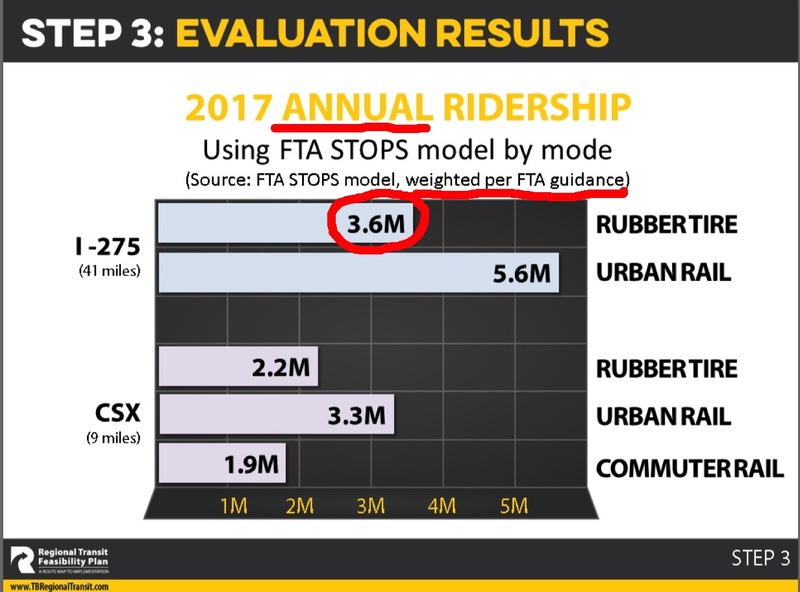 Jacobs is using the FTA STOPS model released in 2013 that included transit evaluation changes implemented with a 2013 FTA Final Rule. Read the rule for a head spin for how unelected bureaucrats in the DC Swamp, with way too much time on their hands, write and dictate voluminous federal regulations. For ridership estimates using STOPS, a trip by a transit-dependent individual counts twice, while all other trips count only once. 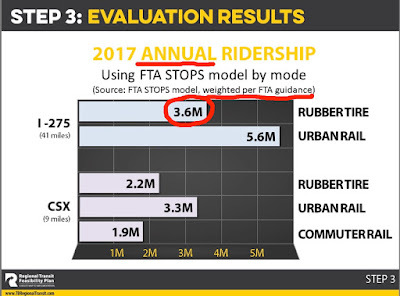 Below are ridership estimates for Jacobs proposed BRT using STOPS and its weighted FTA guidance. With light rail toxic in Tampa Bay, Jacobs felt compelled to change the term to "urban rail" but it's the same thing. And the 9 mile Tampa-centric CSX project ends up as a top contender in a campaign for regional transit projects that "best serve the region and supports growth"??? Using that weighted model, Jacobs is estimating the proposed BRT's ridership to be 3.6 million annual riders. Extrapolate that annual number backwards and it is about 69K riders per week or about 9800 riders per day. Considering a portion of the riders will be commuters and some portion are transit-dependent riders, the actual number of individual riders could be significantly less - perhaps only about 5K individual riders a day. Compare that to 200K vehicles a day on Tampa Bay interstates, many vehicles with more than one passenger. The populations of Hillsborough, Pinellas, Pasco is about 3 million with Hillsborough and Pasco growing. Now we know why Jacobs annualized the ridership because daily and weekly ridership is so low. Going back to the CityLab capital cost per rider, based on estimated ridership and capital costs, what is the capital cost per rider for this project? At 9800 riders a day, the capital cost per rider is $45K per rider. At 5000 riders a day, the capital cost per rider is $90K per rider. Is this really a cost-effective project? How does 5000-9800 riders a day provide any congestion relief to Tampa Bay? The $1.5 million Jacobs effort was not to solve a transportation problem but to pursue a new pot of money. The intention was to "create" a transit project that could meet FTA requirements to enter the "Hotel California" federal transit funding spigot pipeline. The Hotel California federal funding spigot is where taxpayers check in but can never check out....."you can never leave"...because the flexibility to change course or eliminate it when a project fails is lost. 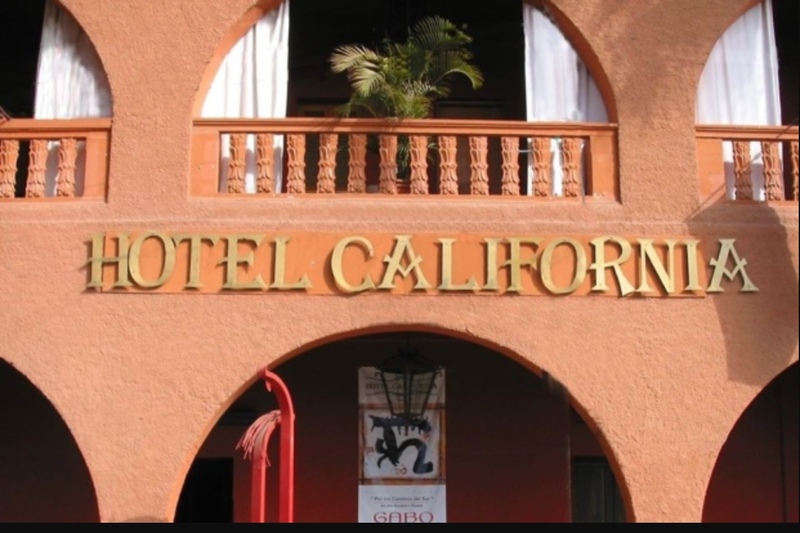 There's a critical puzzle piece missing that is required to get thru the doorway to check into Hotel California. That missing piece is a committed long term local funding source. The Jacobs effort started out flawed and the result looks flawed. This proposed $500 million BRT with no congestion relief looks flawed and not really cost-effective. And taxpayers should not get stuck in Hotel California paying for it.